Hortus Camdenensis | Rhaphiolepis indica (L.) Lindl. Half-hardy, bushy, spreading, evergreen shrub with glossy, deeply-toothed, lance-shaped leaves, to 11cm long, and loose racemes of white flowers, to 1.5cm across, in spring and summer. To 1.5m. Useful for hedging in frost-free areas. [RHSE, Hortus, Hilliers']. 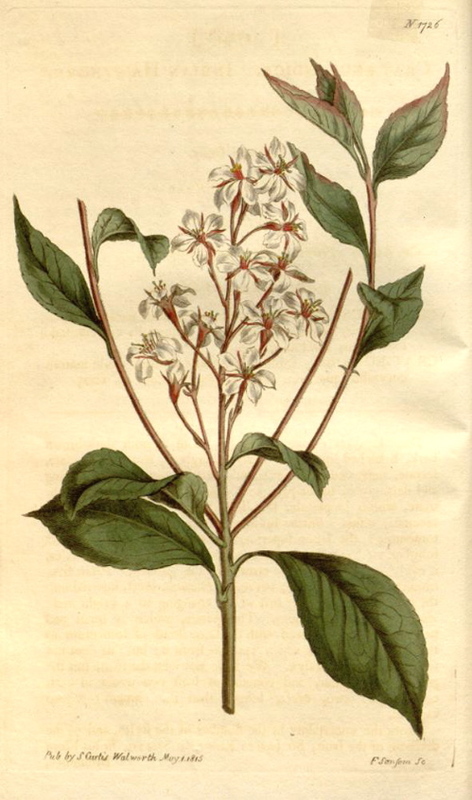 ‘Raphiolepis is proposed by Mr. Lindley in an unpublished tract on Pomaceae, the first section of Jussieu's Order of Rosaceae. The character was kindly communicated to us from the author's manuscript. […] A Chinese plant. Introduced by Mr. James Drummond in 1806. Said by Loureiro to grow to a large tree, the wood of which is of a reddish hue, heavy and tough, and applicable to various economical purposes. The Haw or fruit is eatable. Mr. Lindley thinks that the Crataegus rubra of Loureiro is another species of this genus. The drawing was taken from a plant which blossomed in April last in the greenhouse at the botanical garden of the Horticultural Society near Hammersmith, an establishment which, under its present liberal and judicious superintendence, promises to become a valuable depository of curious and useful vegetables.’ [BR f.468/1820 as Rhaphiolepis indica]. BM t.1726/1815 as Crataegus indica. Listed only in the 1857 catalogue [T.818/1857]. More details about Rhaphiolepis indica (L.) Lindl.